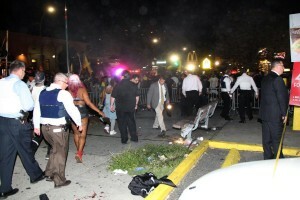 At least four people were shot, two fatally, as gunshots erupted at the bustling J’Ouvert celebration in Brooklyn despite NYPD doubling their parade patrols. The annual West Indian heritage celebration was marred by deadly violence just before 4 a.m. when cops rushed to eastern Prospect Park following reports that four people had been shot in two separate incidents. A man was shot in the chest, along with two women wounded at Flatbush Ave. and Empire Blvd., while another woman was shot in the head minutes later at Washington Ave. and Empire Blvd., police said. The male victim and the woman shot at Washington Ave. died, police added. One person was stabbed at Ocean Ave. and Empire Blvd. Cops initially outnumbered revelers during a quiet start to the Carnival kick-off that quickly exploded with a cacophonous march in Prospect-Lefferts Gardens and Crown Heights. Celebrators packed the anticipated street party tossing paint and powder into the air as more than a thousand NYPD officers watched over the J’Ouvert, an event marred by violence in the past. Vendors at the Carnival kick-off welcomed the heavy police presence even if it meant sparser crowds — and fewer customers.